The Manhattan Institute has long been committed to staying at the forefront of urban-policy innovation. In the 1970s and 1980s, the questions of urban policy were existential—could America’s major urban centers survive at all? Today, this question has been answered with a resounding yes in many U.S. cities, from New York to San Francisco, and Denver to Houston. Yet that very success poses new challenges to a new generation of urban leaders. Today’s urban citizens demand effective, efficient government services. They are less tolerant of bureaucratic dysfunction. Technology is transforming the world; government is no exception. And the experiences that today’s urbanites have with technology, from the iPhone to Uber, set a high service-delivery bar that citizens expect government to meet. Meanwhile, problems of success, such as uneven economic advancement and soaring rents in many cities, pose challenges to future urban growth. The Manhattan Institute has long been committed to staying at the forefront of urban-policy innovation. 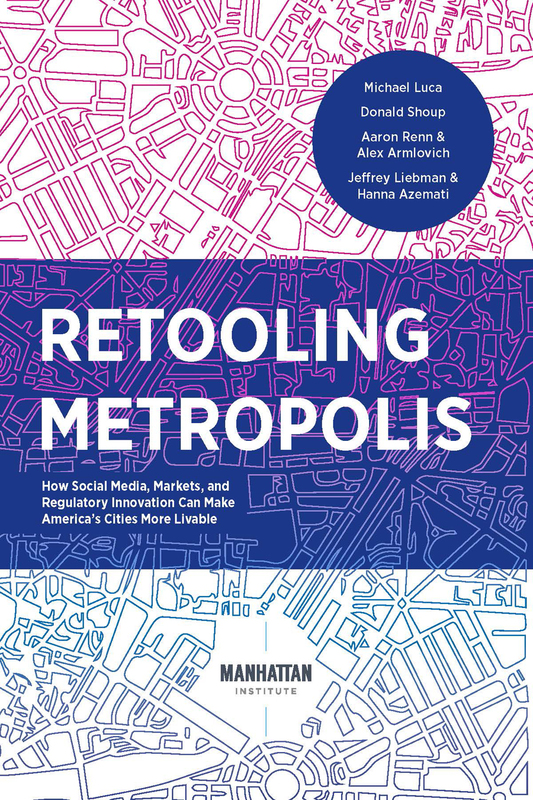 To that end, we have partnered with leading academics to commission the series of urban-innovation essays found in this volume—essays that speak directly to some of the big challenges that U.S. cities now face. In the first essay, Harvard Business School’s Michael Luca discusses the innovative work that he and his team did in partnership with Yelp, a customer-review website, and the cities of San Francisco and Boston. Traditional urban-data applications have involved either making better internal use of government data or posting government data to an online portal to allow private users to take advantage of it. In Luca’s work, there is a bidirectional flow of data and more collaboration between private firms, such as Yelp, and cities. Luca examined public-health inspection scores in San Francisco and helped get that information onto Yelp—a useful thing for the many diners who peruse it before selecting a restaurant to visit. He also discovered that reviews posted on Yelp can be used to predict which restaurants will subsequently fail health inspections. Luca worked with the city of Boston to run a contest to create an algorithm to apply that insight to Boston, which could potentially allow health inspectors to more efficiently target restaurants that are likely to have violations. In the second essay, UCLA’s Donald Shoup outlines better ways for cities to manage their on-street real estate. Demand for parking is growing with cities, and new technology offers new ways of managing parking. He suggests that cities should use market-based pricing for parking meters, varying the price by time of day to reflect the variation in demand for parking spaces. He outlines the concept, and then reviews the results achieved when San Francisco implemented his policy for its new SFpark system. Shoup also describes how market-based pricing could be extended to residential street parking. His plan: allow neighbors to petition for a uniform price auction to allocate spaces to homeowners. The money raised would then be spent in the neighborhood itself. Rich and poor neighborhoods would both benefit through a “power-equalization system” of financial allocation. In the third essay, Alex Armlovich and I address the problem of soaring housing prices in many U.S. cities. To help ease this burden, we suggest more aggressive permitting of so-called microunits—apartments that are smaller than conventional studios. We highlight a number of the barriers to microunit construction, including minimum unit-size regulations, a lack of multiunit zoning generally, and other de facto restrictions, such as density caps. We then review the experience of microunits in Seattle and other cities, as well as the political barriers to them, including legacy opinions shaped by the history of single-room-occupancy hotels. In the final essay, Jeffrey Liebman and Hanna Azemati, both at Harvard’s Kennedy School, discuss ways to help cities improve their contracting. Virtually everything that cities do involves some type of contracted purchase from the private sector. In Boston alone, contract purchasing totals $1.2 billion per year. But the contracts themselves often have not been changed in many years. Instead, they are simply rolled over as they expire. There is little high-level focus on pursuing strategic contracts, either. Liebman and Azemati recommend that cities assign a senior member of the mayor’s inner circle to be responsible for strategic management of the city’s contract portfolio; and that cities explicitly define their goals for major procurement efforts, structure the contracts correctly (such as by bundling or unbundling items) to achieve those goals, and investigate innovative types of contracting, such as problem-based procurement. These essays address diverse topics. But they all cover themes that directly speak to the problems, as well as the opportunities, that today’s city leaders face.